April 12 – The reputation of Chelsea fans has once again been called into question after the club banned three people from entering the stadium for Thursday’s Europa League quarter-final at Slavia Prague after a video appeared to show them singing an abusive song about Liverpool’s Egyptian forward Mohamed Salah. The clip was widely circulated online showing a group of six men in a bar singing that Salah, who is a devout Muslim, was ‘a bomber’. Liverpool have branded the video ‘unadulterated bigotry’ and condemned the “vile discriminatory chants” as being “dangerous and disturbing”. Chelsea’s security team reportedly studied the footage and three men were denied entry to the stadium in Prague after the latest despicable incident perpetrated by Chelsea fans this season. The club are working to identify the other three culprits. “This behaviour needs to be called out for what it is – unadulterated bigotry,” said a statement from Liverpool, who ironically host Chelsea in the Premier League on Sunday. “There is no place for this behaviour in football; there is no place for it in society. 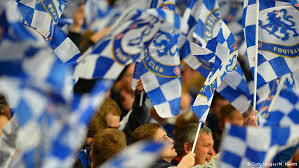 Chelsea released a statement saying the club finds “all forms of discriminatory behaviour abhorrent”.